How to Extract Glossary Term from Shape Name? Current: How to Extract Glossary Term from Shape Name? A glossary term is a word or phrase that is important within your project scope. For example, vehicle, brand and manufacturer can be glossary terms of a car rental system. In Visual Paradigm, terms can be identified by manually recording term under glossary grid, extracting from description or user story scenario, or from shape name. In this tutorial, we will see how to identify term from the name of use case. 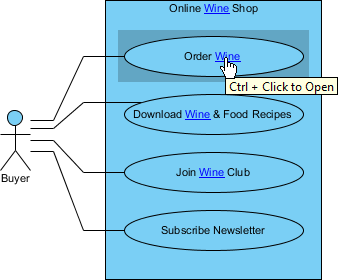 Download Online Wine Shop.vpp from this tutorial in advance. Open the project with Visual Paradigm. You can open a project by select Project > Open from the application toolbar. 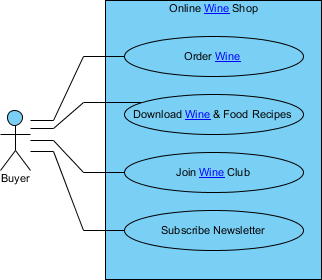 Open the use case diagram Online Wine Shop. You should see four use cases there. Now, we want to extract the term Wine from the diagram. Double click on the use case Order Wine to enter inline editing mode. Right click on the word Wine and select Add "Wine" to Glossary from the popup menu. You should see a message appears on the status bar, telling you that the term Wine has been added into the glossary grid. Click on the link of glossary grid to go there. If you have missed that, do not worry. You can open the glossary grid by selecting Modeling > Glossary > Glossary Grid from the application toolbar. The glossary grid will appear, with the term Wine shown in the grid. In addition to identifying term, we also want to describe the term, to tell reader its meaning. 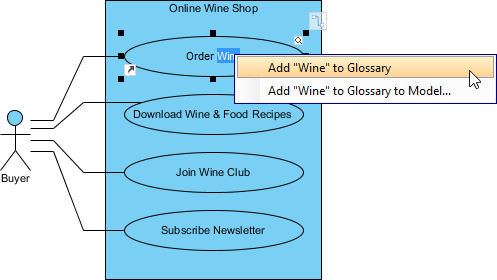 Right click on the term Wine in glossary grid and select Open Term Editor from the popup menu. Enter the definition: A product buyer can order online. Go back to the use case diagram. You can see that the words Wine are all highlighted. Press the Ctrl key. Move the mouse pointer over the word Wine in use case (shape). Click on it. This opens the glossary grid.